Maybe it's that "gatherer" mentality I have (although some might call it hoarding). And maybe that's really what drew me to the industry in the first place (all those little bits and bobs I could gather up and no one would ask why). So today's post is all about little things. Starting with these tins. I have had these little tins for a while but have never found a use for them till now. I painted the inside of the lid with Weathered Wood Distress paint to give a bit of an aged look. I also used Gathered Twigs Distress Ink to color a small piece of cheesecloth and added it to the lid with Multi Medium. I chose two metal embellishments to alter. 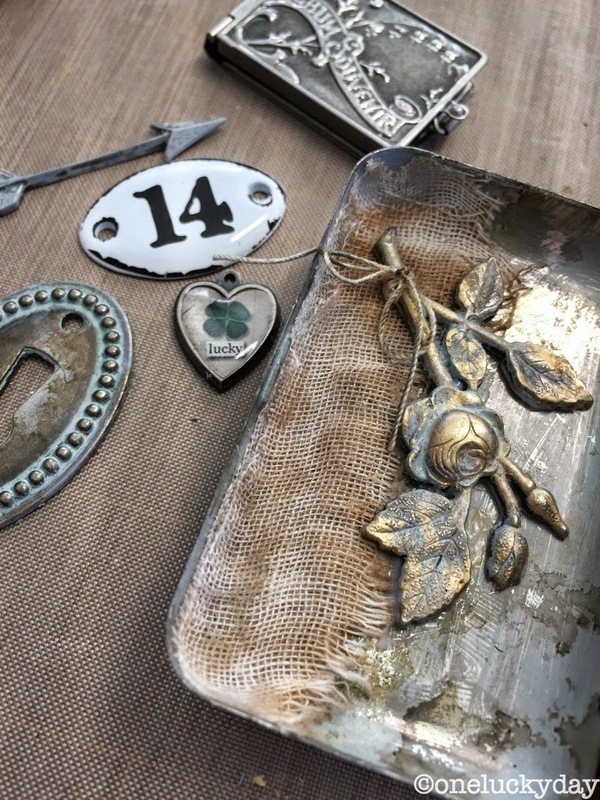 Adornments - Nature: I painted the rose adornment with Weathered Wood Distress Paint. Once dry, I added gold Alcohol ink over the top, leaving just enough of the blue coming through. 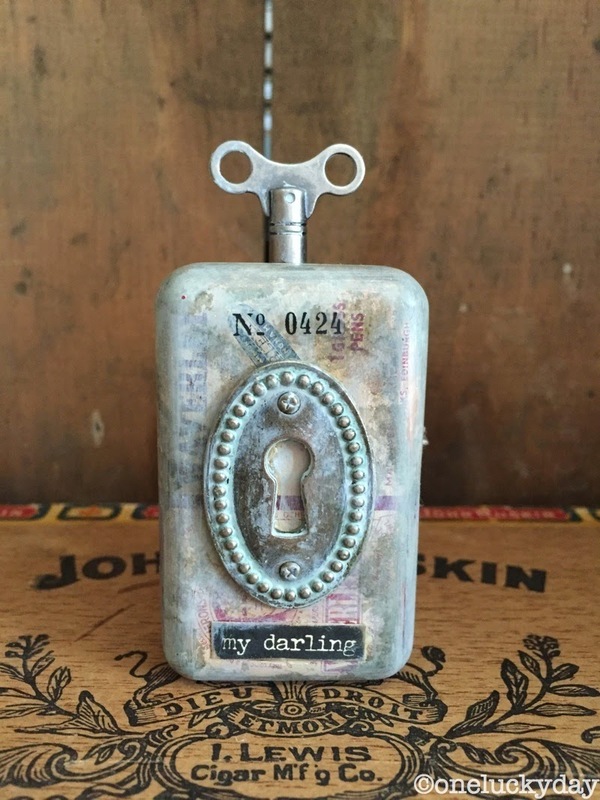 The Keyhole - I painted the metal keyhole with same Weathered Wood Distress Paint. I let it dry for about 15-20 minutes until the paint was tacky, then burnished it with a soft cloth until I wore away the paint in the center. I finished it off with a bit of Mushroom Alcohol Ink to darken it up. I also used Mini Fasteners to make it look like the Keyhole was screwed to the front of the tin. In reality, the Mini Fasteners were placed into the holes and bent back, then the Keyhole was attached to the lid with Glossy Accents. The numbers came from the Special Delivery Remnant Rub sheet (this new rub sheet has a huge amount of numbers, perfect for all my little projects). The black word strip is from Small Talk, which is a booklet full of short sayings (3 sheets of black and 3 sheets of white). I decided to add the smallest Clock Key at the top. This time I did pierce the tin with an awl to permanently add the Clock Key in place. The little Salvaged Doll of course! So cute! I used Mushroom Alcohol ink over her body and rubbed it around with a piece of felt (wear a rubber glove if you are worried about the alcohol ink getting on your skin). I added a bit of vintage looped tatting (something I collect) to make a collar for her dress. It looks a bit blue green because I pounced a bit of Pool Alcohol ink into the tatting to give it some color. I adhered the collar to her dress with Multi Medium because it dries clear and it isn't shiny. The tiny pearl in the center of the collar is from an old necklace. The Typed Token was painted with gold Alcohol Ink and then Weathered Wood Distress Paint was added to the edges. The No.84 is from the Remnant Rub sheet. I tried a few different trinkets in the background of the tin. Like these tiny buttons. However, I ended up going with a Alpha Chip and a Heirloom Rose at her feet. It just seemed to fill the space a little better. Love my little box. So sweet with the pink cotton fabric in the background. I guess my take away from today is, don't over look small things that might just make a big impact. I'm bookmarking this to "another" Paula fav! Thanks for the eye candy, love it! I love it! 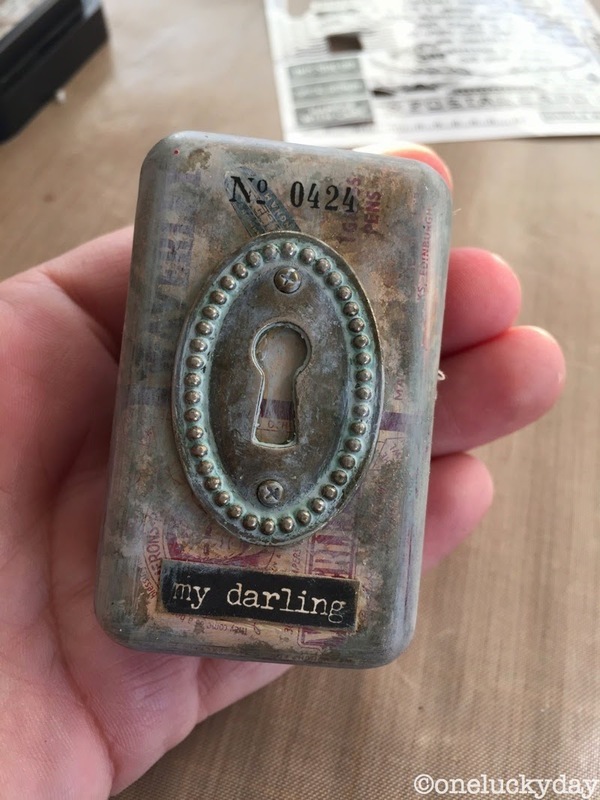 My husband saved his Altoid Tin for me just so I could make something like this! Pinning! I absolutely adore what you did here. . . you are amazing. Now the tin was gorgeous to start with, but your alteration has made it 10 times prettier! Love this project, both the outside and the inside, and yes, the second version with the little rose is definitely better! Sigh - beautiful Paula! Keep hoarding.... um collecting your bits and bobs - that make fantastic art! The outside is beautiful, the inside is adorable! This is really sweet Paula! TFS! Beautiful - makes me wish I had picked up some tins on my last expedition to the antique mall. Fabulous project Paula! 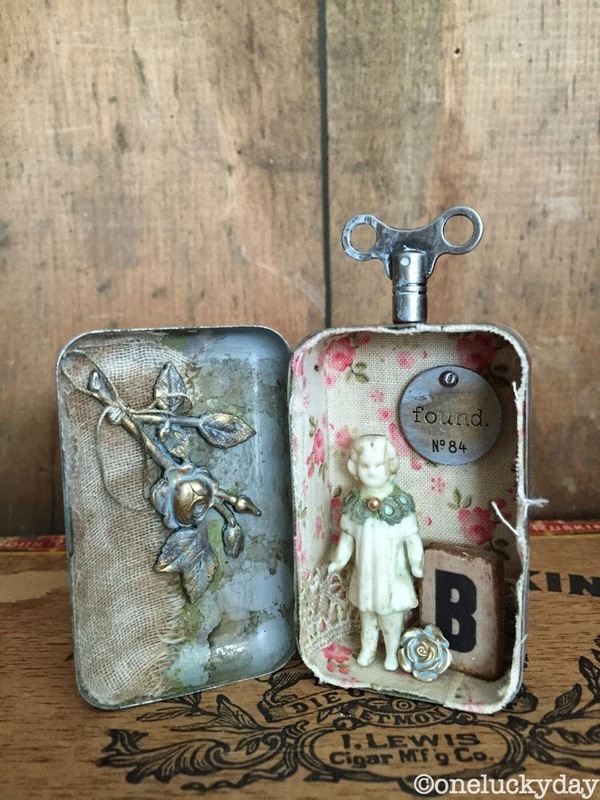 Love the sweet vintage tin! What a fun and creative piece! Love it! Can't wait to get my hands on some of those dolls. Friday is the day the vintage stores are opened around here. Looks like tomorrow I will be on the hunt for tin boxes. OH MY ... How adorable is that ! Just so cute how you decorated the tin ! Can't wait to get those dolls ... I love them ... I got so giddy when I saw them during sneak peeks ! Adorable tin! Can't wait to get one of those dolls! I love tiny things too! I started my collection tiny things when I was a child. Some are so small they had to be glued on paper to stand up. what's your address? when will you be out of town? I'm having really bad thoughts...lol! So much goodness is such a small package! And now if you'll excuse me, I need to go find a small tin or thirty! I absolutely love this! We must be soul sisters because I love and collect tiny things, keep broken jewelry to use in crafting and the "B" you used is my initial-lol! Adorable! I love how you make everything look vintage. Just perfect. Absolutely wonderful! Love what you did with every element of small-ism! I still love miniatures which was a former passion of mine! And I must get that doll! Makes me giggle. So sweet Paula. I love this miniature creation, I hope you make some more like this! This is adorable. I love the new doll, and the lace collar is so cute! Paula, that is wonderful! 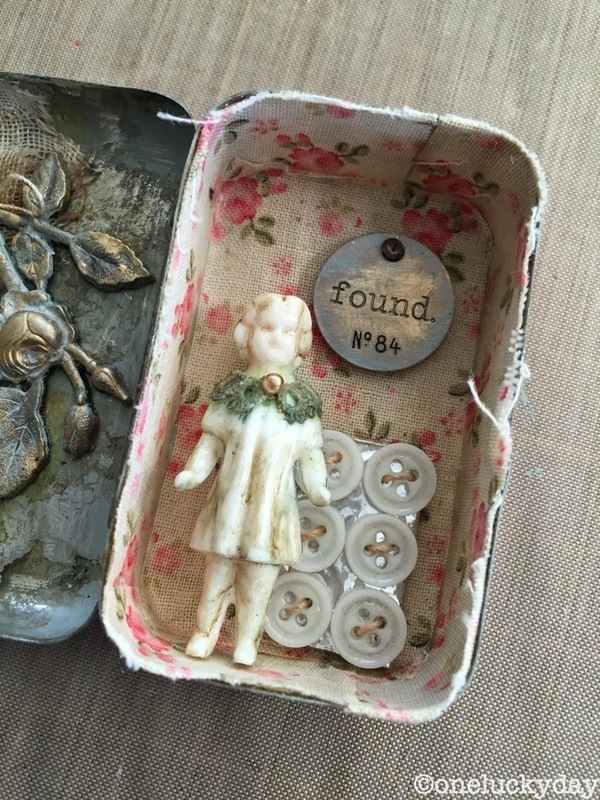 Those little tins have been waiting all along for that little salvaged doll. In your blog I discovered a wonderful world full of beautiful works, really compliments and thanks for coming to me. 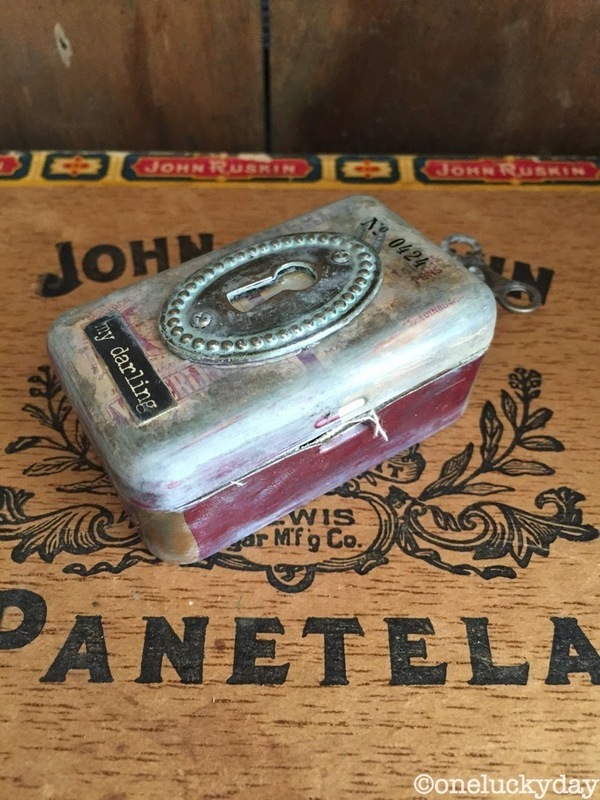 Thank you for sharing such a neat idea with us, dear Paula! From one miniature collector to another - LOVE them!